“Journalists have struggled historically to apply the notion of balance to the reporting of climate change science, because even though the overwhelming majority of the world’s experts agree that human-driven climate change is real and will have major future impacts, a minority of scientists dispute this consensus. Reporters aimed to be fair by giving both viewpoints equal attention, a practice scholars have labeled false balance.” This report from The Oxford English Dictionary by Declan Fahy of Dublin City University. This false balance affects opinions of all makes. Because we as humans get most of our news from the media, and the media is providing biased information, a great injustice is being innocently and blindly committed. Here, Fahy is displaying his own form of false balance (in my opinion, and I am not a global warming psychologist.) Major impacts are occurring right now, not in the future, and they are very much worse than anything consensus climate science reporting organizations has suggested so far. This false bias thing extends even to environmental advocates. At the highest levels of the most prestigious environmental conservation and climate change advocacy organizations, policy and opinion are far behind, as much as 20 years behind. The dominance of Fox News is a privileged source for a majority of cable news viewers in the U.S. in July 2017 for example. Fahy tells us that, “journalists (have) now amplified uncertainties as they covered climate change as a controversy” because they are presenting inaccurate information form privileged sources to a majority of those seeking news information on climate change. False balance in climate reporting has been addressed by some media outlets says Fahy. Techniques to overcome viewer or reader skepticism have been implemented to show sources of statements and motivation. But skeptical statements on settled science continue to be dominant in Conservative news outlets. In reporting climate impacts and future scenarios, journalistic objectivity and fairness norms continue to lag behind. The lag is driven by lack of deep knowledge and the continuing tendency to report both sides of the story. Journalists are not scientists and do not have the deep scientific knowledge of scientists. They also do not have the language skills to understand the jargon of deep science, so they cannot fully grasp the validity of a vastly small minority of science that is reported as being different from the vast majority of science. Their ethical fairness demand then requires them to report both, giving the appearance that one is as valid as the other. There is an antidote to this seemingly unsolvable situation. Some of us –many of us– do know the difference between accurate and inaccurate climate science. When we see or hear inaccurate science being delivered equally to accurate science, it is our responsibility to notify the deliverer of their inaccuracy. A detailed scientific citation is not required. If an ethical journalist is notified of an inaccuracy in his or her reporting, they are then ethically bound to investigate this inaccuracy and correct it. The details are not required by the notifier, only the concept. The rest is the ethical responsibility of the journalist. It might be that the “balance” issues so well described here by Fahy, and previously by Brulle 2013 and his work on the Climate Change Counter Movement, precludes action to correct inaccuracies in the Conservative prestige media. But times are changing. More of us calling out the same old tired Conservative talking points will have an effect, if enough of us cry out. What is needed is a change of tone. Why aren’t we more angry about the destruction of the world that we depend upon for life? As more of us come to realize that climate change is indeed the most important issue of our time, more of us will use the most important behavior motivation of all — emotions. It’s this anger emotion that has driven Trump to the position of Supreme Being. Get angry. It works. And importantly, walk in beauty. Anger does not mean violence. It does not even mean mental violence. It is simply a motivational tool. Harness the energy. 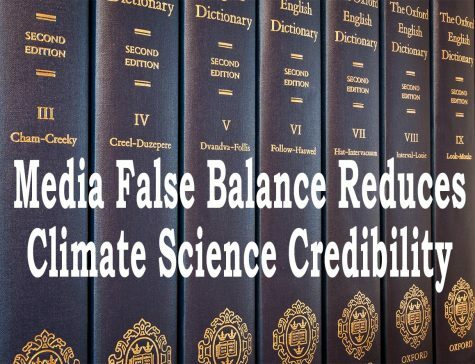 Fahy, Objectivity, False Balance, and Advocacy in News Coverage of Climate Change, Oxford English Dictionary, March 2017.